With summer upon us, and temperatures rising, I sure don’t feel like turning my oven on, which also happens to be very convenient for my “no bake challenge”. So, here’s another no bake recipe for you, the perfect portable snack for picnics, barbecues and family outings all summer long or in a brown bag lunch all year long. 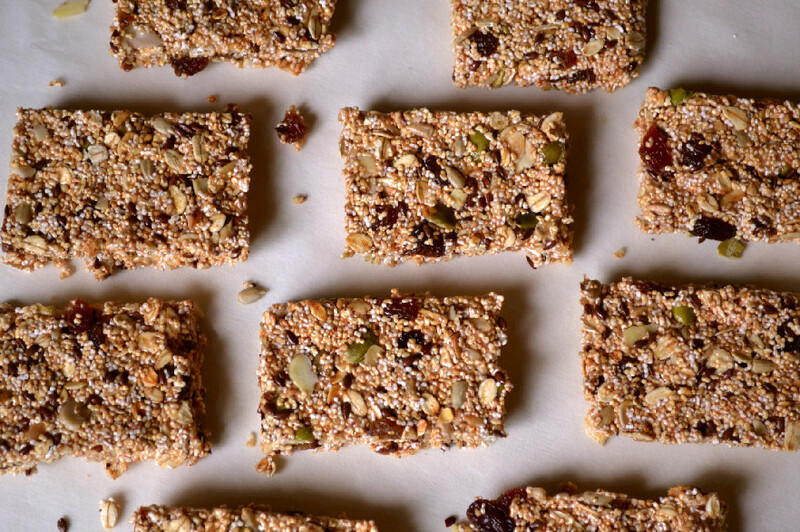 A healthier and tastier alternative to commercial granola bars that are loaded with sugar and/or high fructose corn syrup and other additives. As I mentioned a few weeks ago, Amaranth has taken the number one spot on my list of favourite breakfast porridge grains/seeds. I also discovered that it comes in this popped/puffed version which is perfect for breakfast on those days when its just too hot for porridge. I like to mix it with puffed brown rice and steamed corn flakes and have it with rice milk. 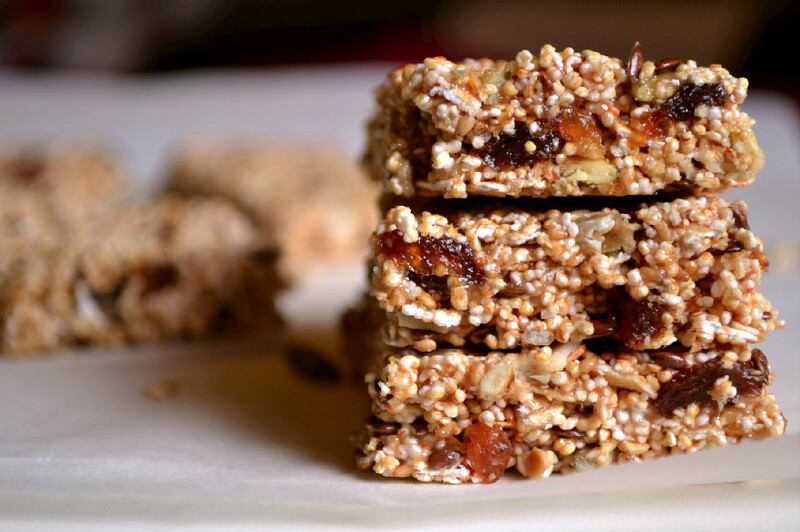 Puffed amaranth also happens to be great for making no bake treats like these Amaranth Oat Granola Bars. 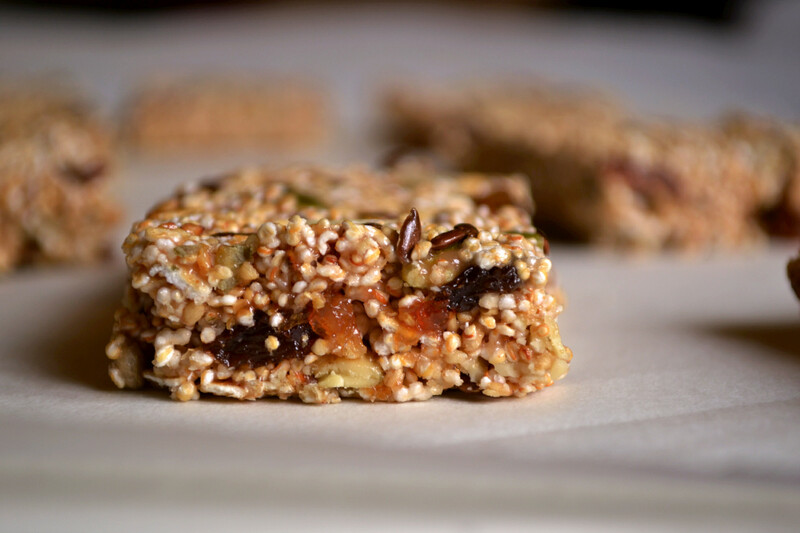 These bars are loaded with goodness; puffed amaranth, rolled oats, raisins, pumpkin seeds, sunflower seeds, slivered blanched almonds, flax seeds, sesame seeds, and almond butter. 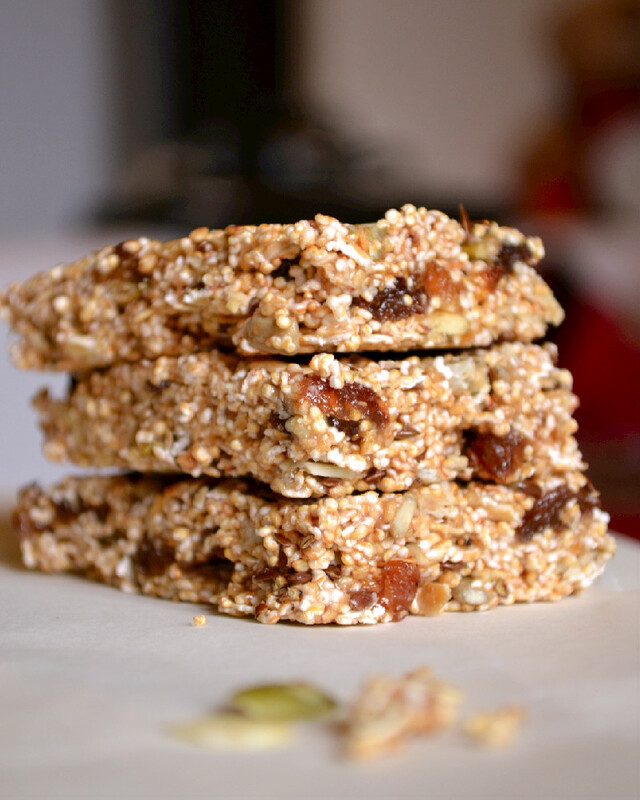 They are refined sugar free and naturally sweetened with raisins and a touch of brown rice syrup. Enough said, here’s the recipe, now go make ’em! Dry toast the oats, seeds an almonds separately and one at a time, in a dry pan over medium heat for 2-3 minutes each. The seeds will start popping once toasted. The oats and almonds will slightly brown. Combine amaranth and toasted oats, seeds, almonds and raisins in a bowl. Combine almond butter and brown rice syrup in a small pot and melt together over medium heat for about 2 minutes stirring frequently. Be careful not to leave it on for two long or it will start to stiffen up. Combine wet and dry ingredients and stir together until well incorporated and all ingredients are bound together. The mixture should be sticking together but shouldn’t be too sticky to handle. Press mixture firmly into an 11 x 7 parchment paper lined glass baking dish, using your hands or the back of a spatula. Let rest for 20-30 minutes then slice into bars or squares. 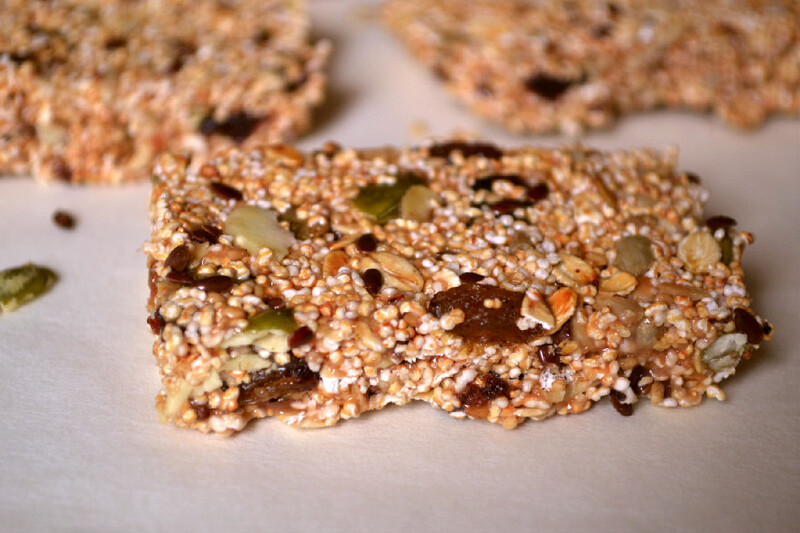 Enjoy for breakfast on the run or as a snack throughout the day. Perfect for a brown bag lunch, family outings, picnics and more.